“Ancestry.com LLC is a privately held Internet company based in Lehi, Utah, United States, started in 1983. AncestryDNA is a subsidiary of Ancestry LLC. “AncestryDNA uses a simple test to analyze an individual’s DNA. AncestryDNA offers the potential of identifying new insights into people’s ancient ancestry to help them collaborate with distant cousins and make even more discoveries into their family history.” Ancestry began selling its DNA tests in 2012. Click here for full description at Wikipedia. A special note is being made concerning the Terms and Conditions in force and effect for consumers and users of the AncestryDNA test kit. Recently, an inaccurate and controversial article entitled “AncestryDNA and Genealogy – Ancestry.com takes DNA ownership rights from customers and their relatives Research” by Joel Winston published at Medium.com caused much consternation in the genetic genealogy community. Read below for more perspective and an official response from AncestryDNA. With All Due Respect, by Judy Russell, CG, CGL, posting at The Legal Genealogist. Judy corrects various pieces of erroneous information from the Winston article at Medium.com and clarifies the AncestryDNA terms and conditions. Click here to read. Setting the Record Straight: Ancestry and Your DNA, is the official response of AncestryDNA to recent misinformation regarding its terms and conditions. Click here to read. According to the AncestryDNA FAQ: “AncestryDNA uses advanced scientific techniques to produce your results. We measure and analyze a person’s entire genome at over 700,000 locations. During the testing process, each DNA sample is held to a quality standard of at least a 98% call rate. Any results that don’t meet that standard may require a new DNA sample to be collected. AncestryDNA test uses the “saliva collection” aka “spit” method. Approximate wait time for results is 6-8 weeks; however, with recent sales, the wait has been 3 months of more. The lab used for processing AncestryDNA kits is located in the United States. 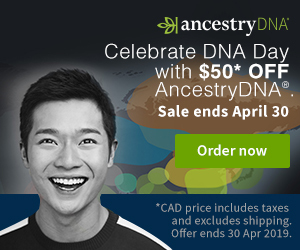 AncestryDNA claims “The World’s Largest Consumer DNA Database” with over 3 million testers. AncestryDNA recently added Genetic Communities feature.